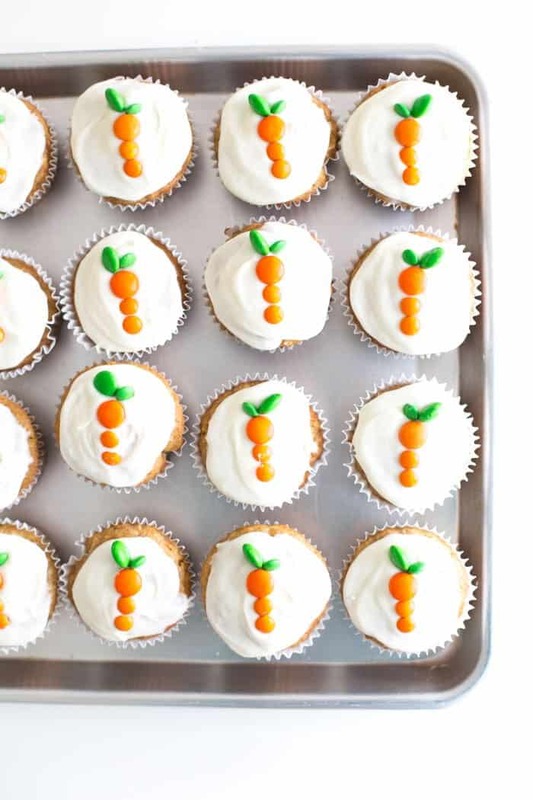 Best Carrot Cake Cupcakes & Cute Carrot Toppers - So Festive! 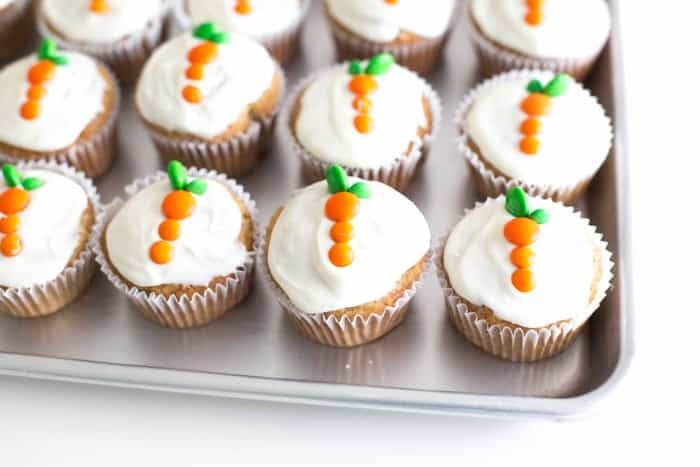 Amazing carrot cake baked into cupcakes with cute M&M toppers make a festive Easter dessert! Are you a fan of carrot cake? Carrot cake was always so-so for me. Especially the carrot cake filled with nuts, pineapple, and all sorts of other random ingredients. Sure, I’d eat it, but it was never a dessert that I would intentionally make. Until now. I came across this best carrot cake recipe from Mel’s Kitchen Cafe. She claims that this recipe is her all-time favorite and she’s tried quite a few. So I trusted her judgement. I used her recipe as the base, but decreased the sugar and increased some of the spices. Instead of baking it into a cake, I knew these would make darling Easter cupcakes. You guys! I’m a huge fan now! I think this dessert will become an Easter tradition! 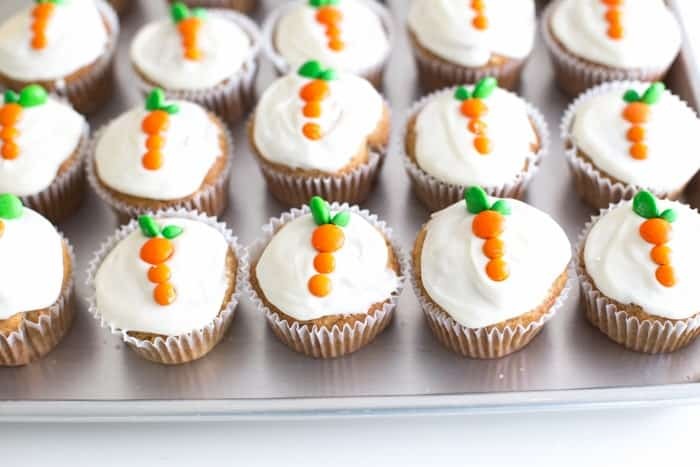 I mean, the cupcakes are adorable and all with those cute carrots on top, but they taste delicious, too! And if my husband says they get presentation points and taste points, well, we know we have a winner! Don’t let this “carrot cake from scratch” scare you. I’m all about simple, but this cake really doesn’t take much more effort than a box-cake would. There’s just a few extra ingredients to add. Plus, you can make this cake in advance, so you can bake it a few days early and pull it out for your Easter dessert. 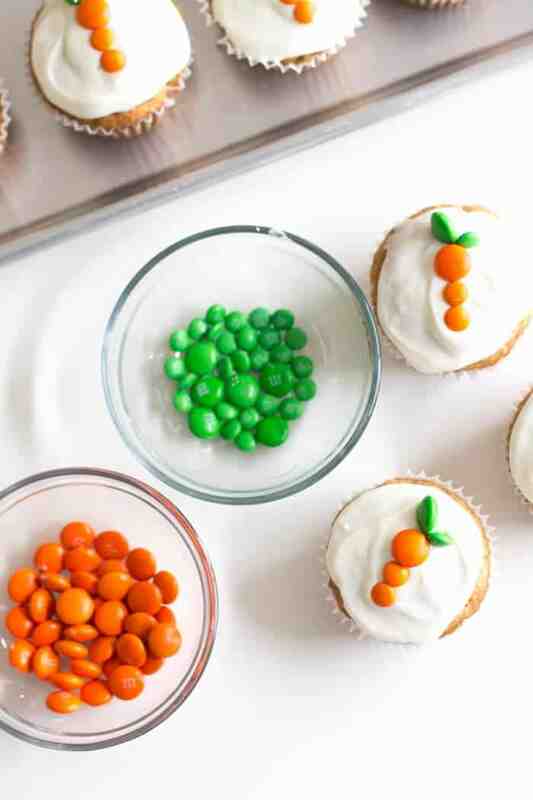 For the carrot cupcake toppers, all you need is orange and green-colored M&M candies. You will need both the large size and mini size to make the carrots. If you have a store that sells these candies in bulk, that might the best way to buy them so you can get exactly the colors and sizes you want! You can always buy a regular-size bag if you don’t have a bulk option. For each carrot, you’ll need 1 large green, 1 small green, 1 large orange, and 2 small orange M&Ms. Once the cupcakes are frosted, simply place one large M&M just above the center. Place 2 small orange candies below, to create the carrot topper. Then add one large and one small green M&M for the carrot top! Seriously, it doesn’t get much easier than this! Kids could even help make these! Line cupcake tins with cupcake papers or spray lightly. In a separate bowl, beat the sugar, brown sugar, and eggs on medium-high speed until well combined. Reduce the speed to medium and with the mixer running, add oil (or oil and applesauce) carefully not to splatter. Increase the speed to high and mix until the batter is light in color. Stir in shredded, chopped carrots and dry ingredients by hand until incorporated and no streaks of flour remain. Be careful not to overmix. Pour the batter into the cupcake tins and bake for about 15 minutes, or until a toothpick inserted comes out clean. Let the cupcakes cool for 5 minutes and then remove them to cool completely. To make the frosting, whip the cream cheese, butter, sour cream and vanilla together until well combined. Slowly add in the powdered sugar. You may want to add more depending on how thick you want it. 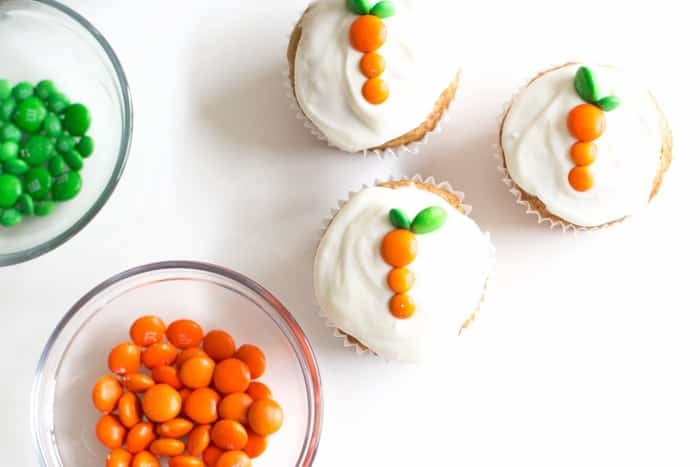 Once frosted, use green and orange M&Ms to make the carrot toppers. Original recipe from Mel’s Kitchen Cafe, but I’ve altered the recipe. Party Food: A Tart Bar!